As Trump meets Putin, will the king of the deal finally make one? Analysis: Trump is very likely to declare his meeting with the Russian leader a win. The question is whether he'll actually score one. HELSINKI — President Donald Trump thinks of himself as the king of the deal, but as he sits down with Russian President Vladimir Putin here Monday, there's scant evidence that he's been able to translate his business-world philosophy into effective bargaining on the international stage or at home. Veteran Republican and Democratic national security hands are so worried Trump will be outmaneuvered by the former KGB agent that they are praying that nothing at all comes out of this summit. Their concerns are rooted in a foreign policy track record running light in the wins column: so far, the man behind "The Art of the Deal" has shown little acumen for making them — but a habit of declaring victory anyway. He was so frustrated with his inability to sway the G-7 last month in Quebec City that he abruptly withdrew from a joint declaration agreed upon by the group of like-minded nations and lobbed insults at the host of the conference, Canadian Prime Minister Justin Trudeau, from the comfort of Air Force One. Here, Trump used the absence of a deal to proclaim victory. From there, he traveled to Singapore for a historic summit with Kim Jong Un, the brutal North Korean dictator who craved the global status provided by a meeting with the American president. The two leaders signed off on a vague document outlining a possible future denuclearization of the Korean Peninsula, with Trump promising to suspend joint military exercises with South Korea. Again, Trump proclaimed victory. Since then, the Kim regime has abandoned talk of denuclearization, upgraded a major nuclear research facility and stood up U.S. negotiators at a planned meeting to discuss the repatriation of the remains of soldiers killed during the Korean War. The meeting over the fate of the soldiers' remains finally took place Sunday. And at the first stop on his current trip, in Brussels for a North Atlantic Treaty Organization meeting, Trump brandished threats to have the U.S. part ways with NATO and to withdraw U.S. troops from Europe. After an emergency private meeting of the leaders of the trans-Atlantic security group, Trump said he had secured a promise from all the countries to aim to spend 2 percent of their respective gross domestic product totals on their own defense, crediting himself with squeezing allies into compliance — even though that figure represented the exact same goal they've had since 2006. As Trump departed for London, and meetings with Prime Minister Theresa May, French President Emmanuel Macron said the NATO nations, including the U.S., had signed a joint declaration of goals the day before and nothing had changed in the interim. That didn't stop Trump from declaring yet another victory. What is Trump's objective in meeting with Putin? 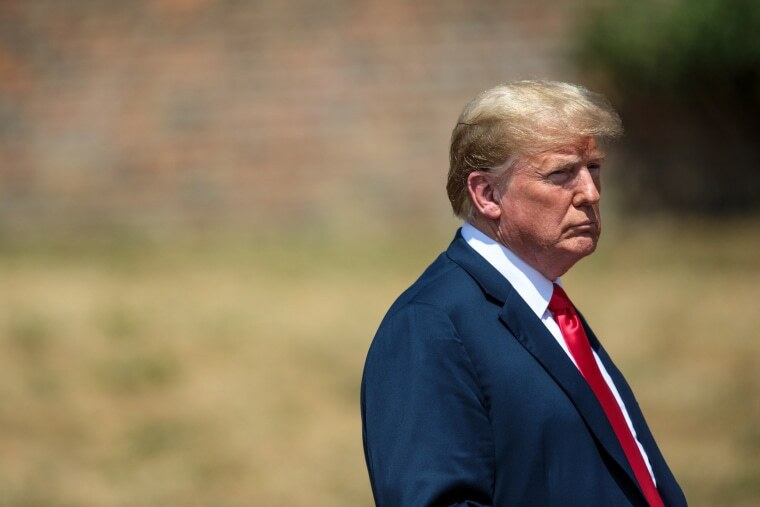 His plan to force the hands of China, Canada, Mexico and the European Union on trade with a new tariff system have, so far, blown up in his face, with retaliatory actions hurting the bottom lines of many U.S. manufacturers and agricultural producers. Rather than getting China to give in, Trump made a major concession to Beijing soon after negotiations began by lifting sanctions that precluded the Chinese telecom giant ZTE from doing business with American suppliers, despite warnings from Congress, where there is broad bipartisan agreement that the removal of the ban is a threat to national security. Even at home, and on his top domestic priority, Trump has failed to cut a deal effectively. He's made no progress with Congress on his promises to build a wall on the U.S.-Mexico border and slash both legal and illegal immigration. That's not just because he can't sway Democrats. Last month, after his aides helped negotiate an immigration bill with House GOP leaders and Trump lobbied fellow Republicans to vote for it, it failed miserably on the House floor. While the bill angered Trump's political base, and while that means it was probably in his best interests to see it fall, the episode was yet another reminder that the legend of Trump's prowess as a negotiator may be just that — a legend. Indeed, as Trump prepares to negotiate with Putin, an adversary of the U.S., he so far appears to have given away more than he's gotten. And even his trademark unpredictability — "We have to be unpredictable, and we have to be unpredictable now," he said in his first foreign policy address of the 2016 campaign — hasn't exactly proven out. If anything, he's followed patterns articulated in his bestselling book, "The Art of the Deal," which was first published in 1987 and is an easy window into Trump's thinking for any ally or adversary who hopes to negotiate with him. When Trump thinks he senses weakness in partners, he says he seeks to maximize his leverage by "having something the other guy wants. Or better yet, needs. Or best of all, simply can't do without," as he wrote in his bestselling book "The Art of the Deal." If he's working without that advantage — negotiating with someone who is in a position of strength — "leverage often requires imagination, and salesmanship... you have to convince the other guy it's in his interest to make the deal," he wrote. That's translated into picking fights with weaker allies, and buttering up American enemies and adversaries. "He is very talented," Trump said of Kim following their summit in Singapore. "Anybody that takes over a situation like he did at 26 years of age and is able to run it and run it tough. I don’t say he was nice or say anything about it. He ran it, few people at that age. You can take 1 out of 10,000 could not do it." Never mind that Kim murdered members of his own family to strengthen his grip on power. Trump, after all, likes his strongmen strong. Trump also reserves high praise for Putin, the autocrat who tampered with the 2016 election to help Trump and who says he's developing weapons that can evade Western ballistic-missile defenses. "He is a strong leader," Trump told NBC's Chuck Todd in 2015. "What am I going to say, he's a weak leader? He's making mincemeat out of our president." More important, as a former spymaster, Putin is surely aware of another presidential pattern: The way to Trump's heart is through his ego. While Putin may not have called Trump "a genius," as Trump has long asserted, he did say then-candidate Trump was "colorful" and "talented" — certainly enough flattery to turn Trump's head. Trump said this week that he will raise a number of issues with Putin, including election meddling, Russia's annexation of Crimea and further incursions into Ukraine, nuclear arms control and the situation in Syria. But the American president didn't say how he would like to see those issues resolved. So it's not even clear that Trump knows exactly what his administration hopes to accomplish, other than a meeting with a Russian president whose profile on the global stage already has been enhanced by Trump's attention. Asked about his goals by CBS, Trump said, "I'll let you know after the meeting." In the same interview, he said the possibility of asking for the extradition of 12 Russian spies who are charged with hacking into systems of Democrats to help Trump in 2016, hasn't crossed his mind. "I haven't thought of that," he said. "But I'll certainly be asking about it." Then he blamed Obama for letting it happen, even though Trump publicly asked Russia to hack into rival Hillary Clinton's emails on the very day the Russian spies are alleged to have made their first effort — "after hours" — to compromise email accounts connected to her personal office. There can be little doubt that Putin, who has effectively run Russia for the last 18 years, knows exactly what he wants from the U.S. in Helsinki. The question is what Trump is determined to gain: a major deal on the international stage, finally, that concretely benefits the U.S. — or just the chance to give another hollow declaration of victory, and a photo with Putin to commemorate it.